Streeet Art and Urban Art fans, rejoice! The most anticipated Berlin museum of the past few years is here! As you know by now we are huge street/urban art fans and have followed the phenomenal development of the Urban Nation project. From a gallery space, to taking over the neighborhood in Schöneberg and the street art world by storm! 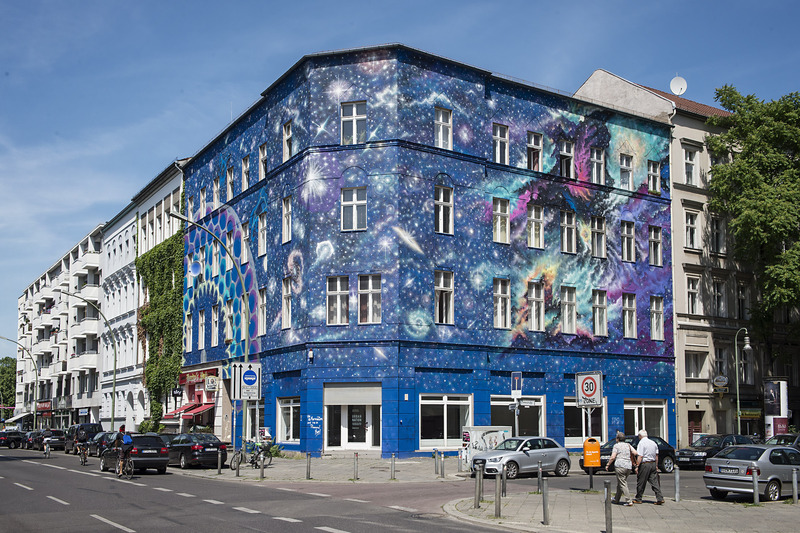 Since 2013, they have been transforming Berlin’s streets and facades into giant outdoor galleries and connecting people with their city using outdoor art and integrative neighbourhood projects. Contemporary Urban Art and not necessarily just Street Art seems more appropriate to describe what this exciting museum wants to accomplish. After all, the art will spill from the streets inside the amazing art space. The intersection between contemporary art, urban and street art. Or as we call it: Art Paradise! That is what the new Urban Nation Museum of Contemporary Urban Art focuses on. Photo from Urban Nation’s Website. 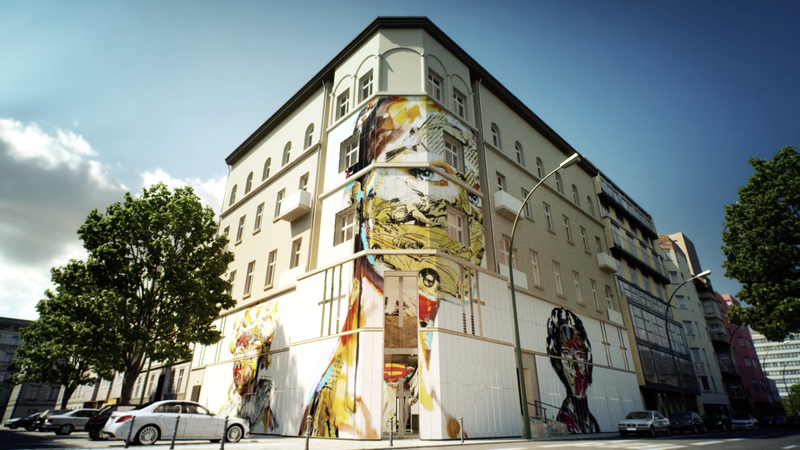 URBAN NATION MUSEUM FOR URBAN CONTEMPORARY ART, or as it has been called up until now Berlin’s first street art museum, is set in an Wilhelminian-era building at Bülowstrasse 7 in Schöneberg. To get here, hop on the U-bhan (U1, U2, U3 or U4) to Nollendorplatz and walk about 3 minutes towards the east (See map below). Invited by URBAN NATION MUSEUM FOR URBAN CONTEMPORARY ART Director Yasha Young to bring summer flavors to Berlin, Project M/9 “Colors” co-curators Charlotte Dutoit and Rom Levy of JUSTKIDS and StreetArtNews have selected 6 internationally acclaimed artists to create murals around the future museum building in Bülowstrasse 7, in Berlin-Schöneberg, from June 06 till June 12, 2016. The museum opened its doors on September 16th, 2017. After 3+ years working with hundreds of artists spreading across 5 decades and probably 6 continents, the doors will open for the first exhibition: UNSTOPPABLE. Along with the many other artists in the collective opening, they will be presenting new works from influencial artists such as: Dain (@dain_nyc), Gaia (@gaiastreetart), Judith Supine (@judithsupine), EL MAC (@mac_arte), Carlos Mare (@mare139), Chris Daze Ellis (@dazeworldnyc), Ella & Pitr (@ellapitr), Esteban del Valle (@estebandelvalle112), FAILE (@faileart), FUTURA 2000 (@futuradosmil), Gabriel Specter (@gabrielspecter), HOT TEA (@hotxtea), Icy And Sot (@icyandsot), Isaac Cordal (@isaaccordal), Jef Aérosol (@jefaerosol) , John Matos (@crashone), Kenny Scharf (@kennyscharf), Nemo’s (@whoisnemos) , Nicolas Romero Escalada (@eversiempre), OX, Saner (@saner_edgar), Swoon (@swoonhq), and Tilt (@tilt) . From Urban Nation’s Facebook Feed. We are sure to become regulars of this museum! And make sure to visit the street art murals and walls around the neighborhood before or after visiting the museum. For more tips on where to see amazing street art in Berlin, check out our Berlin Street Art Tips!